No doubt.. I am a yogurt lover. It was probably one of the most difficult items to release before entering my veganhood lol! I have tried the other yogurts on the market that are made from soy, coconut and almond. It’s almost there in taste but I try to avoid processed foods for my daily food items. 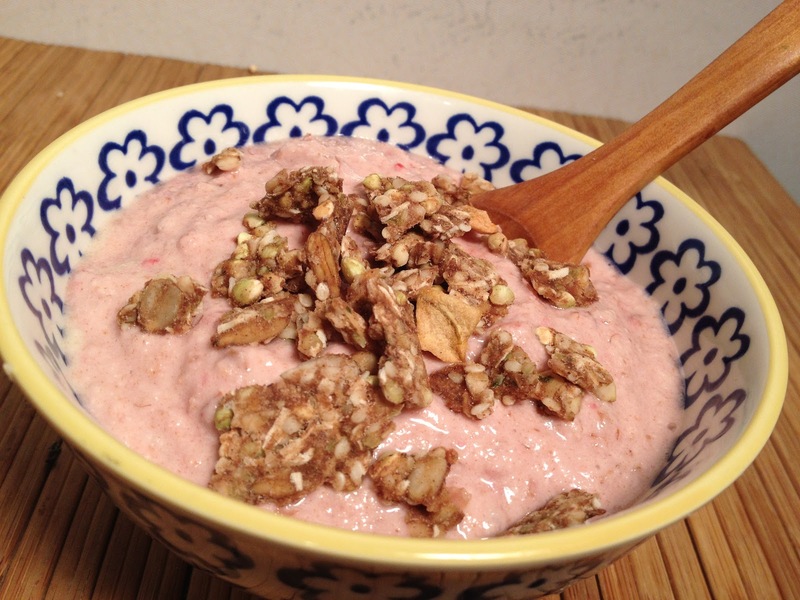 I guess by now, I gave up on yogurt until I came across this recipe in RAWSOME by Brigitte Mars. At least if the consistency isn’t going to be perfect (which it wasn’t) then at least it should be HEALTHY! Oh how I forget in this quest to be an inspired vegan that the real name of the game is HEALTH! Wait.. I retract that. It was my first goal but now the farming system and the suffering it causes to the animals and our planet is my goal as well! I do choose to be a healthy vegan though even as I experiment with all these vegan ideas and recipes. So.. raw vegan nut-based yogurt– I didn’t even know it existed! I soaked my almonds for almost 24 hours, drained/ washed them and then put them in my Montel blender with the water. I mixed them well and then poured it into a milk bag and let it drain out the excess liquid overnight. I let this process take place at room temperature. The next day I soaked the dates and put them in a food processor. I added the almond pulp from the bag. It was still a heavy textured consistency for me. I will try to grind the almonds longer before and after it ferments. I may also choose cashews next time. It’s in my best interest to perfect this recipe. I used strawberries as well which helped sweeten the flavor. This is healthy, raw and full of bio-available nutrients!